We are committed to providing close to home care whenever possible. There are infusion service locations in Cadillac, Charlevoix, Gaylord, Grayling, Manistee, St. Ignace, and Traverse City. 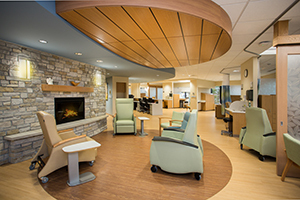 The Carls Foundation Infusion Suite at Cowell Family Cancer Center serves adult and pediatric patients throughout northern Michigan, as well as those visiting the area for an extended stay. Our Infusion Clinic is located on the second floor of the Cowell Family Cancer Center at 217 S. Madison St., across the street from Munson Medical Center. Parking is available on-site. Hours are Monday through Friday, 8 am to 4:30 pm. 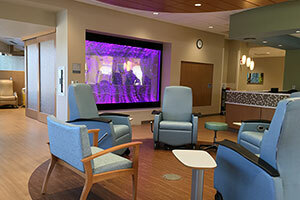 The clinic provides a comfortable and relaxing environment with 47 chairs/beds. The Infusion Clinic is staffed with experienced Registered Nurses who specialize in the care of patients with cancer and chronic diseases. All of our nurses are certified to give chemotherapy. The clinic has access to a full service specialty pharmacy, staffed with board certified Oncology Pharmacists. All patients must have a physician referral and schedule an appointment in advance. Patients should contact their physician in advance of scheduling an appointment or faxing orders.